Gen. Vincent Brooks, U.S. 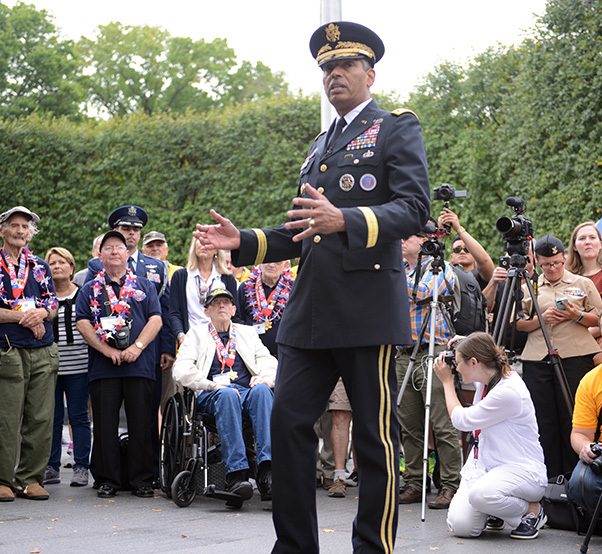 Forces Korea commander, spoke with Korean War veterans, Sept. 24, 2016, at the Korean War Memorial in Washington, D.C. About 88 veterans of the Korean War visited the Korean War Memorial in the nation’s capital, Sept. 24, 2016. 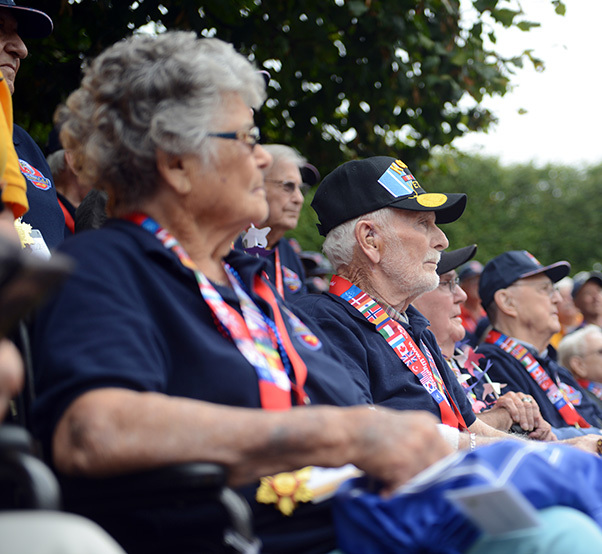 About 88 veterans of the Korean War arrived in the nation’s capital this week for a visit to the Korean War Memorial Sept. 24. 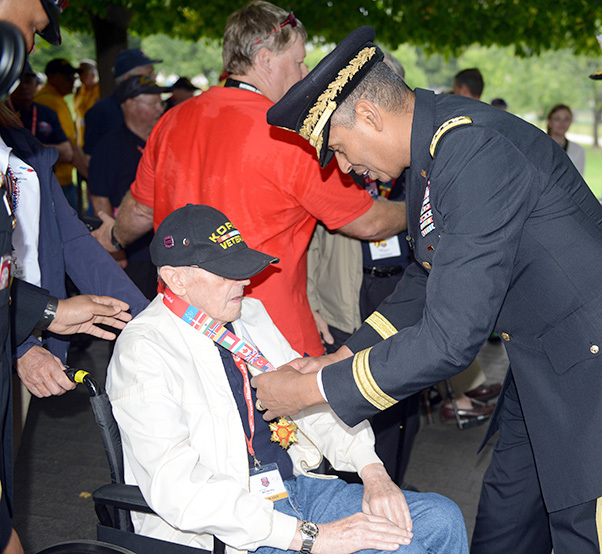 The veterans, who came to Washington, D.C., courtesy of Blue Ridge Honor Flight out of Ashville, North Carolina, laid a wreath at the memorial and also received from the Korean government a medal commemorating their service. Attending the event with the veterans was U.S. Forces Korea commander, Gen. Vincent K. Brooks, and Maj. Gen. Shin Kyoung-soo, a Korean defense attaché to the United States. Korea, he said, is now one of the world’s top economies, one of the top trading partners of the United States, and one of the most innovative nations in the world. And like the U.S., Shin said, Korea can now also afford to send its own soldiers around the world to preserve the peace and maintain democracy. Korea, he said, is modern, well-off, and free. The general told the veterans that he and his countrymen remember what they did for Korea, because they now enjoy daily the prosperity that was made possible by American service members, 63 years ago. Gen. Vincent Brooks, commander of U.S. 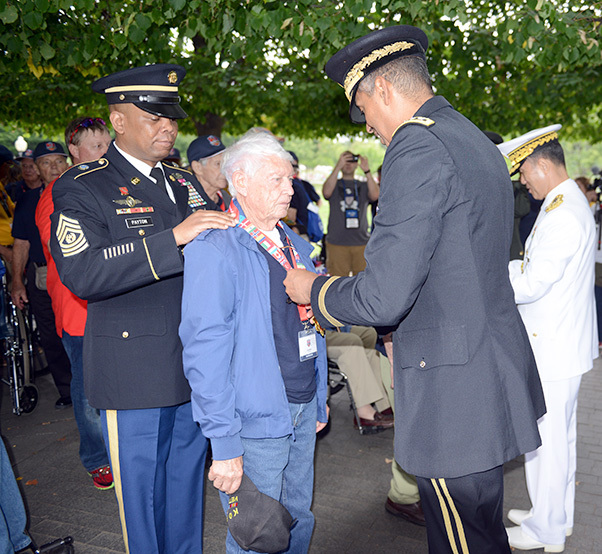 Forces Korea, places a medal around the neck of Korean War veteran William Hartley, Sept. 24, 2016, at the Korean War Memorial in Washington, D.C. About 88 veterans of the Korean War visited the Korean War Memorial in the nation’s capital, Sept. 24, 2016. The Korean War began June 25, 1950, and ended with an armistice on July 27, 1953. In all, on both sides of the conflict, more than 4.4 million military personnel and civilians were wounded, killed or went missing in action. Today, the United States military maintains a presence on the Korean peninsula and remains committed to the defense of that nation, which is one of America’s greatest allies in the Pacific. 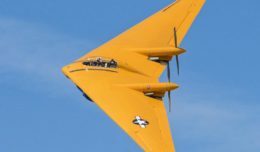 “Our numbers are lower than they have been in history, but our commitment is no less,” Brooks said. Brooks, who is responsible for the more than 28,000 U.S. service members forward-stationed on the Korean peninsula, told veterans at the memorial that the troops he commands today are carrying on the legacy that established during the veterans’ own service during the Korean War. Initially, Brooks had not planned to be at the memorial with the veterans. But he was, coincidentally, visiting the U.S. at the same time to meet with senior Army leaders at the Pentagon, and discuss the current situation on the Korean peninsula with defense and policy leaders. Gen. Vincent Brooks, commander of U.S. Forces Korea, places a medal around the neck of Korean War veteran J.D. Bolt, Sept. 24, 2016, at the Korean War Memorial in Washington, D.C. About 88 veterans of the Korean War visited the Korean War Memorial in the nation’s capital, Sept. 24, 2016. Even now, 63 years after the end of the Korean War, Brooks said, it remains important that we recognize the service of veterans. Brownie McCall was among the 88 veterans who came to Washington, D.C., to visit the Korean War Memorial. He was drafted into the Army in 1951. “I was invited in by my president,” he said. In Korea, he said, he initially served as a combat infantryman with the 1st Cavalry Division and carried an M1 Garand rifle. He was ultimately injured in combat and received a Purple Heart for his injuries. Gen. Vincent Brooks, commander of U.S. 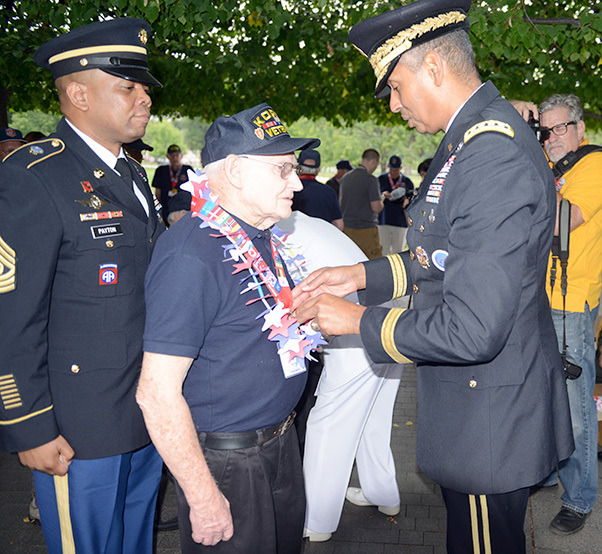 Forces Korea, places a medal around the neck of Korean War veteran Ray Fore, Sept. 24, 2016, at the Korean War Memorial in Washington, D.C. About 88 veterans of the Korean War visited the Korean War Memorial in the nation’s capital, Sept. 24, 2016. He said he was knocked out for about six hours. As a result of his injuries, he said, he was unable to continue to fight. He was later transferred to military intelligence and served with the 45th Infantry Division. For McCall, it was his first trip to the Korean War Memorial. Hilliard Staton, who joined the Navy in 1947, eventually got a commission in the U.S. Marine Corps in 1952. He found himself in Korea in 1953, where he was a tank platoon leader with 1st Marine Division, 1st Tank Battalion. 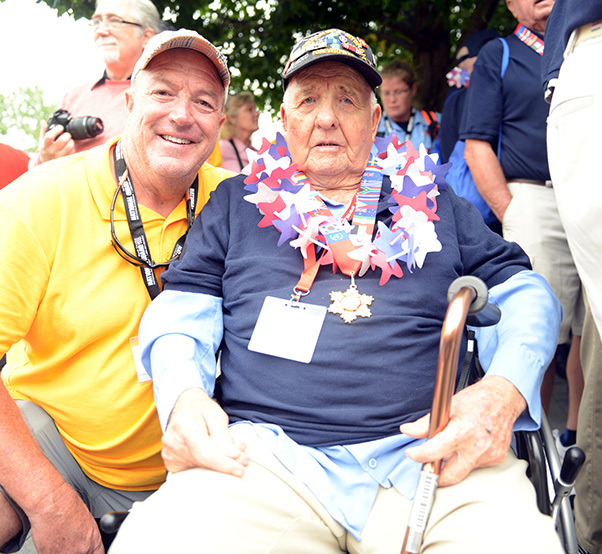 Jack Walsh, left, a “guardian” with Blue Ridge Honor Flight, of Ashville, N.C., escorted Korean War veteran Brownie McCall, right, to the Korean War Memorial in Washington, D.C., Sept. 24, 2016. 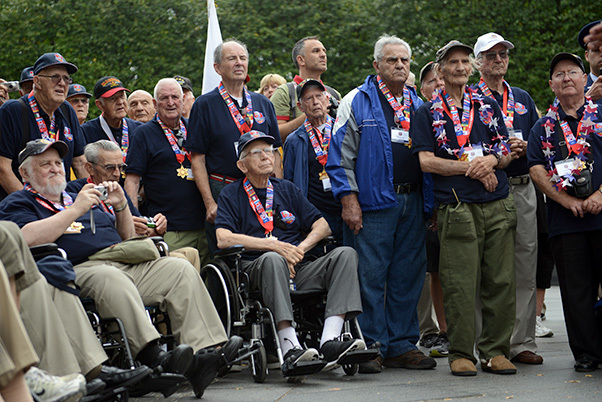 About 88 veterans of the Korean War visited the Korean War Memorial in the nation’s capital, Sept. 24, 2016. Staton was one of two veterans who laid a wreath at the memorial during the honor flight visit. Staton said he arrived in Korea during the last year of conflict there. Not all Korean War veterans have been back to Korea since the end of the conflict there. But Staton has been. And he said he’s impressed by what he saw there. “It is a most fantastic country now,” he said. About 88 veterans of the Korean War visited the Korean War Memorial in the nation’s capital, Sept. 24, 2016. The veterans, who were brought to Washington, D.C., courtesy of Blue Ridge Honor Flight out of Ashville, North Carolina, laid a wreath at the memorial and also received from the Korean government a medal commemorating their service. Attending the event with the veterans was U.S. Forces Korea commander, Gen. Vincent K. Brooks, and Maj. Gen. Shin Kyoung-soo, a Korean defense attaché to the United States. When he was there in 1953, he said, he never saw so much as a paved road or glass in the windows. He never even saw a town. James Jean, who enlisted in the regular Army in June 1950, laid a wreath at the memorial along with fellow veteran Staton. He served as a cryptographic specialist, arriving in Korea in May 1951. Since then, he said, he has returned to Korea three times to visit. Much has changed since he first arrived there more than 60 years ago, he said. On one trip he made to Korea, he said, he visited Panmunjom, at the Joint Security Area on the demilitarized zone between South Korea and North Korea. There, he was paired up with a Korean school girl as part of the educational tour set up for him and fellow veterans by the Korean government. 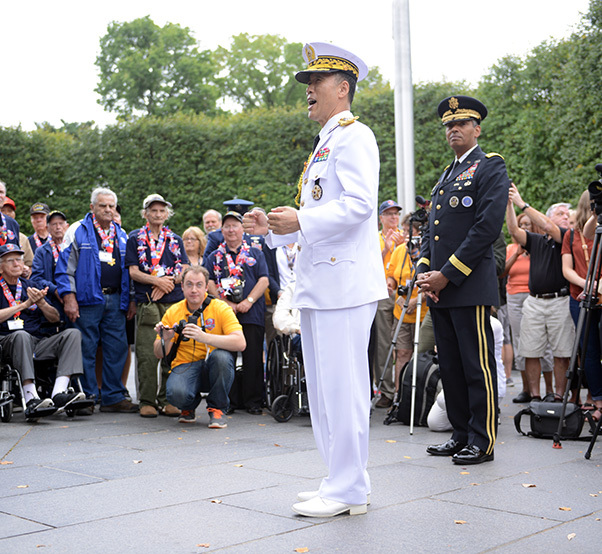 Maj. Gen. Shin Kyoung-soo, a Korean defense attaché to the United States, spoke with Korean War veterans, Sept. 24, 2016, at the Korean War Memorial in Washington, D.C. About 88 veterans of the Korean War visited the Korean War Memorial in the nation’s capital, Sept. 24, 2016.